To DONATE to UnLucky’s cause, please use our site’s donation link or send your donation to our shelter. Be sure to note it for Unlucky. Thank you! Update: 9/28/10 – UnLucky is more lucky than some. According to his foster family, he is now wearing a boot on his leg in the hopes that his leg can be saved. Several veterinarians believe that the nerves in UnLucky’s leg are not as damaged as first thought. This handsome boy has a long road ahead, but hopefully, with love and healing his damaged limb will regain strength. However, the best news is yet to come. UnLucky’s foster family has fallen head over heels for this loving pup and has decided to make him a permanent part of their family. Bravo! How “lucky” can you get? We would like to give a very gratetful thank you to The Times News for putting the picture of Unlucky in the paper. The letter to the editor was the only place Unlucky, the abandoned rottweiler, could reach the public for those who would hear about his horrible plight. The only place!!!! Humans did this to poor Unlucky, and now that he did survive, he needs humans to help him to recover from his long term injuries. UNlucky needs an M.R. I so they can determine the extent of his leg damage before they cut his leg off. That alone is over a thousand dollars. Unlucky’s emails are asking where to send their donations. Please send donations to Unlucky The Dog at Carbon County Friends Of Animals, 900 Walnut Avenue, Jim Thorpe, Pa. 18229. You must say that it is for the medical expenses of Unlucky. Unlucky is doing well in his foster home for now, and is trusting people more than he did before. He had such a fear of people in the beginning, but, thanks to the loving care he is receiving now, he is less fearful of people. He does not understand that the days ahead will be painful with the amputation and recovery.The worst part of his physical nightmare is yet to come. We who are trying to get this poor dog the medical care that he needs are struggling to help him. Things are going slowly. Please help him!! We want to thank the Times News for printing the picture of Unlucky and our letter in the newspaper. The picture shows what real cruelty to animals really looks like. I am writing this sad letter about a German rottweiler that has to have his leg amputated soon. He was abandoned up on the Broad Mountain in Nesquehoning sometime in July. After several weeks someone finally caught him … I will call him Unlucky because he has had a very rough time to survive up there. No food, no water. Hot weather and rainy thunder storms. Snakes and insects, a lot of traffic. And the fear of not knowing where he was for numerous nights and days. And now he has a big fear of people. This poor dog had a hole in his tongue from eating bark or sticks, we suppose. He has some holes in his front right leg and paw. He has a sunken shoulder blade and his foot drags. A vet said his nerves are dead in his leg and it will die and then rot. This poor unlucky dog will have three legs. 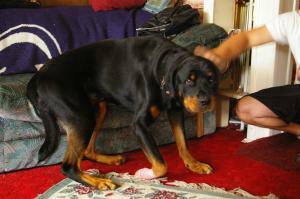 He has a tail and most people do not like a tail on a rottweiler, which puts him on the less likely list to be adopted. He truly will need a new loving home because the foster home he is in now is only temporary and he is trusting them. He will be neuterted. He has a very rough road ahead of him yet. Having his leg sawed off will be very traumatic to his body, with now a life-altering adjustment with three legs. It will cost a lot of money to get Unlucky his x-rays, surgery, medications, and return trips to the veterinarian. Poor Unlucky will need to heal physically and mentally due to all this stress to his body and his abandonment. This poor dog was put up on that mountain to fend for himself and to get hit by a car and die. He was most likely hit by a car because his injuries are horrible. This poor dog had to be in so much pain and scared to death. Unlucky can be helped. Just call Friends of Animals in Jim Thorpe (570-325-9400) and make a donation for Unlucky for his surgeries. He is too beautiful to put down, especially when he tried so hard to survive in terrible conditions. People did this to him. No wonder he is fearful. He will be a beautiful dog for someone, we hope. Please call Friends of Animals to help Unlucky, and then he can be called Lucky. All he wants is to be loved and belong to someone who will give him a loving home and a caring family. It is a shame that this dog had to live a life owned by cruel people who tossed him away like road trash, and apparently slept well afterwards!